Contact-Rick Herron 310-822-8105 or ClassicAutoPicks@aol.com for prints, giclees or acrylic commissions, dealer inquiries also. I have been doing commissions since I returned to painting in 1998. I do acrylic, hand brushed paintings and digital art, detailed and carefully executed. I accept commissions from anywhere across the country and overseas. All that is needed is high resolution photographs to work with. I consult with the sponsor on their desires, type of background etc. and keep them informed of the progress every step of the way. Below are some examples of acrylic paintings and on page two digital art. Mercedes Benz Credit requested this acrylic painting for the opening of a new showroom on the west coast. 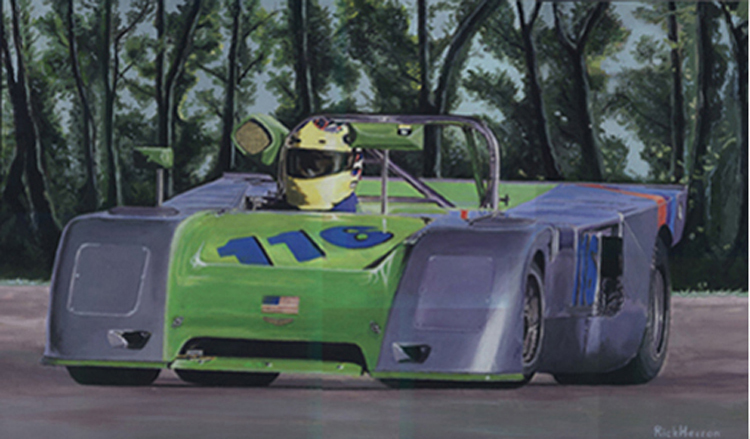 This 24" by 12" acrylic painting was done for an SCCA driver in Colorado. The red car on the left was used for racing venues and the car on the right to drive on the streets. This beautiful Mustang GT and the following two were done for members of the National Capitol Mustang Club. 1967 Mustang GT parked in front of Jerry's Ford during a Northern Virginia Ford car show. The last of the big guns. Mustangs became smaller and less powerful. Even the earlier GTO Judge had to go. The Miata belongs to my brother and was commissioned by his wife for his birthday. Another acrylic painting of a Ford Taurus station wagon was done for their son. Commissioned by the Gulick Group for their owner in his Chevron racing car. This image was scanned on a flatbed by sections.